By about 2 pm on the first day of walking through the Scottish Borders it was becoming clear I’d been wrong imagining the dots on my map to be quant Scots villages full of local eccentrics, well-crafted beer and heavy, happy northern food. The two areas of settlement I’d passed were small clusters of squat and shuttered houses, grey sandstone window frames, darkened slate roofs and doorways offering no welcome. They were perhaps bedroom communities for Edinburgh. Whatever they were, they were barely inhabited: there would be no conversation of any sort, quaint or otherwise. Likewise no cafe or store to pick up lunch. Long-distance walking into unknown or lesser-known territory means reaching a series of decisions without full information. You expect to make some mistakes, and hope they’re neither major nor cumulative. You trust to luck and the kindness of others, if others happen by. Going a bit hungry your first day isn’t the worst that can happen – by far – although in that moment my stomach didn’t necessarily agree. What was worrying was that it was already the middle of the afternoon, and my guidebook told me I had 15 or so kilometers still to walk before arriving at a closed tourist centre from which I might, if everything worked, be able to contact a ride to come pick me up for my hostel. All of which probably meant a very late meal indeed, should there be anything to be purchased at all by the time I got there. In the bottom of my pack I found the broken remains of a two-day old baguette given to me in London, and some packaged cheese I had forgotten to throw out. The cheese was long past sweating, but my hunger convinced me it might still be okay despite hours in the heat. Dryburgh Abbey was further off the route than I had expected, a set of foundation stones and half-walls all that remains of an important medieval structure. The detour had already cost me a couple of kilometers and an hour or so and my feet, unhappy with asphalt, needed liberation from the boots. So I took them off, set my socks in the sun and stretched out my toes. Where we choose to sit and eat can say a lot about us. There was a bench on the grass beside a very low stone wall with a plaque that read “transept side altar”. Barefoot before the altar, feeling the grass between my toes, squinting at where the monks would have filed out from their dormitory to perform the first office of the day, I felt more at home than I had in days. The river Tweed flowing slowly by, the sweat-sweet wetness of my tee-shirt drying on my back in the yellow sun, my stomach happy for, literally, crumbs: part of the joy of walking pilgrimage is the re-sizing of what is needed in life. Even home is re-defined, a sacred flagstone to sit my plastic bag on, in that moment, was enough. Maybe it has always been so, but it seems to me that the starting point for modern Euro-North American pilgrimage is almost never a sacred destination. The starting point is somewhere and everywhere along the unfamiliar trail, in the awkward freedom of being able to go left or right and not knowing exactly which is best or how long to tarry, in the slowness of footfalls in a motorized world, and in the unfamiliar Google-free uncertainty of a path where the next way-sign might be knocked down or misleading and the next person encountered might forever remain a stranger or perhaps become a dear companion. The world shrinks and expands at the same time: we smell the greenness in whole fields of clover, feel each raindrop in a translucent summer shower, and curse the nail clippers we forgot to put in the Velcro pouch under the flap of our bags, or the single black seed pod that, rolling beneath the sock, turns to a blister on our foot. I ate in a hurry, packed up and walked quickly back over the bridge, striding back onto the path. 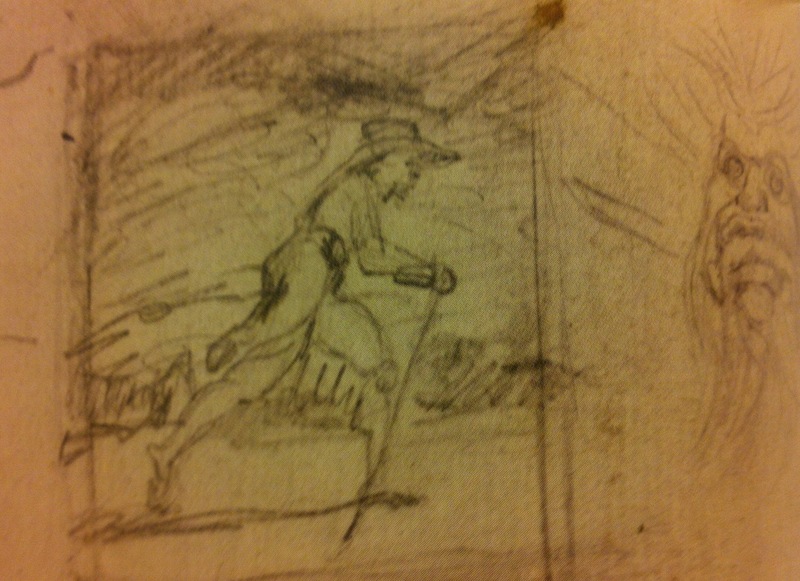 One of Blake’s drawings shows a pilgrim striding purposefully forward, walking stick in hand, much as I was walking toward my unknown future. At Blake’s destination awaits a monster, Death, whose maw is the final destination of no escape. What if he is right? I was not bereft; anyone who has a Visa card and money in their wallet, a mobile phone and a road nearby is never truly in danger. 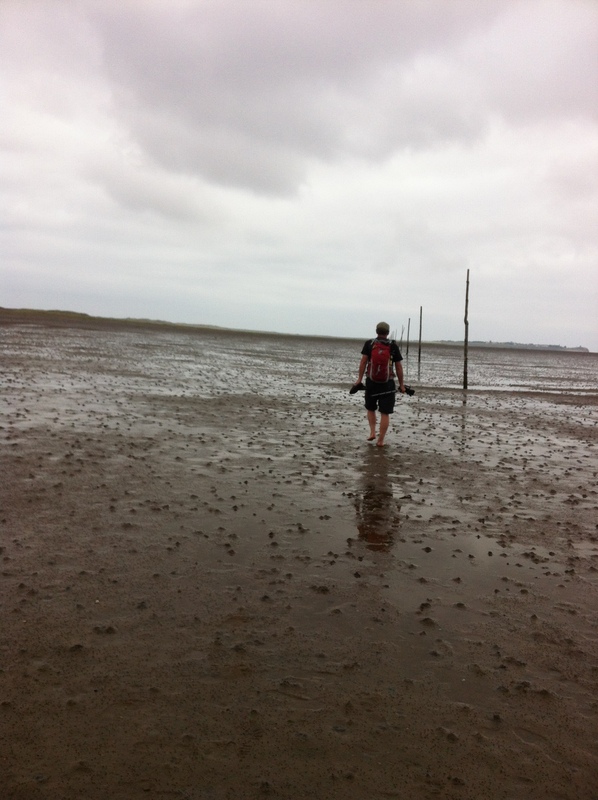 But I’m more and more convinced from my own experience and from talking to others that there is something in the practice of smallness and absence that is part of the appeal of modern walking pilgrimage. Something very powerful happens in practicing the stripping off of the layers of who we are and what we own. Maybe it simply gives us the chance to see what might be there, in us, at the nub. Maybe, I hope, that is what it might be, at the nub. That would be a nowhere to walk to, fast.